RAMALLAH — Palestinian human rights sources unveiled occupation efforts to deport a number of Palestinian prisoners from the occupied territories, after their release. 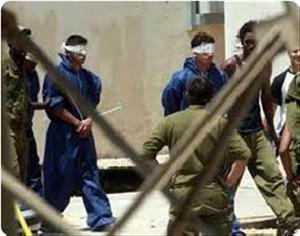 The Palestinian Prisoner Committee said in a press release on Monday, that the Israeli occupation intelligence service the “Shin Bet” is keeping five Palestinian prisoners in solitary confinement cells in Jalama prison, despite the end of their interrogation with them, with no charge. The Committee stated that the court gave the occupation investigators from the “Shin Bet” one week to provide it with an indictment against the five detainees, if not the prisoners should be released. Thus, the intelligence officers proposed the prisoners an offer requiring their deportation for two years in exchange for their release. The statement stressed the prisoners’ complete rejection of the deportation and their determination to stick to their position. The prisoners also called on all local and international human rights organizations to take urgent action and pressure on the Israeli occupation authorities to release them after being detained for two months without charge. Meanwhile, the Israeli prison administration is imposing sanctions that include fines, solitary confinement and denial of visitation rights, against nearly two hundred Palestinian prisoners in Megiddo, the Negev, Jalama and Raymond detention centers.